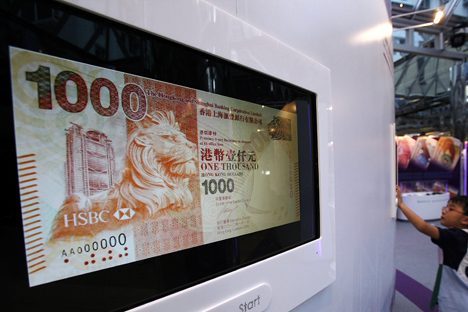 The Moscow Stock Exchange’s currency exchange committee has approved trading in Hong Kong dollars. The decision was made during a committee meeting on Sept. 23. The date of the launch has yet to be determined. Igor Marich, the exchange's executive director on the currency market said that the decision was in response to demands from market participants. According to RBC Daily, Russian corporations requested this currency following the implementation of sanctions by the United States and the European Union. Sergei Romanchuk, director of the Metallinvestbank Trading Center, said that many companies that trade on the Moscow Exchange are concerned that sanctions may restrict the operations of accounts held in U.S. dollars. Accounts in the Hong Kong dollar are also interesting for state banks, which are now taking their money out of Western banks due to the sanctions. At the moment, the exchange is not estimating the amount of trade that will be conducted in the Hong Kong Dollar. Experts believe that the transactions in the currency will be interesting not only for sanctioned companies and banks, but also for other participants of the Russian market who wish to diversify their investments.